Braun Strowman trapped Kevin Owens in a porta potty and tackled it off the stage to close last night's Raw in Sioux Falls, South Dakota. After trying to get it canceled, Owens ran out of his match with Strowman in the main event. 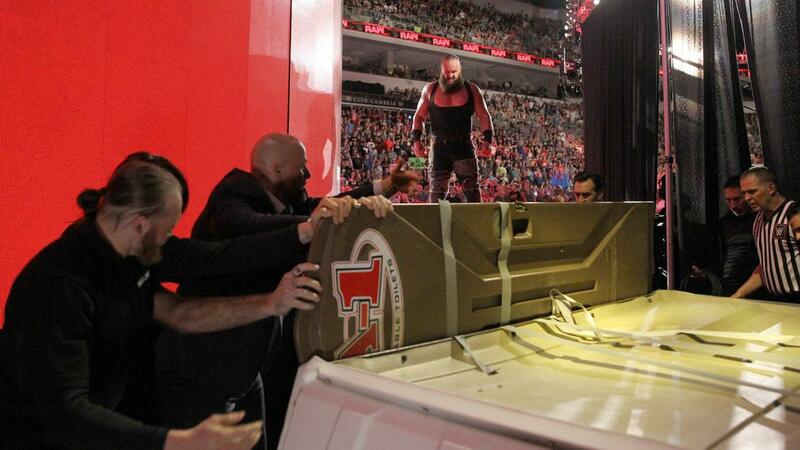 Owens hid in the porta potty in an attempt to hide from him, but Strowman taped it shut and brought him back to the stage. Roman Reigns wrestled twice last night, with both tag matches ending in disqualifications. The Revival interrupted Reigns & Seth Rollins vs. Dolph Ziggler & Drew McIntyre and ended up laying out Reigns with the Shatter Machine. Later in the night, Reigns refused to tag in Bobby Lashley during their match against The Revival. Scott Dawson and Dash Wilder wouldn't stop attacking Reigns in the ring, and Lashley walked out instead of helping him. Reigns vs. Lashley was then made official for Extreme Rules. An extreme rules stipulation was also added to Alexa Bliss vs. Nia Jax at the pay-per-view. Plus, Dr. Shelby returned for Bayley and Sasha Banks' "mandatory counseling."